Ideal for schools, the Primary World Explorer Educational Rug is a large classroom carpet which accurately illustrates a map of the world’s continents and seas. Each continent is colour coded, and clearly labelled with defined country borders so that children can understand and read the map easily. 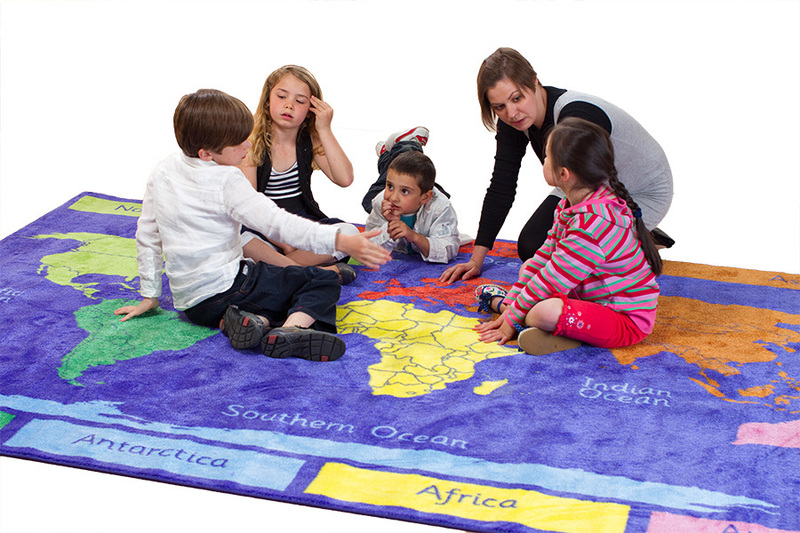 This educational rug is ideal for group learning and the introduction of geography and multi-cultural studies. Manufactured using a extra thick, soft textured tufted Nylon twist pile which is ideal for classrooms and play areas. The specially designed Rhombus anti-slip backing allows you to use the classroom rug on all surfaces. Complete with a 1 year manufacturer’s warranty, and conforms to relevant safety standards EN71 Parts 1, 2 and 3.